This lazy girl’s schezwan chicken bowl is for everyone who remembers that they don’t have dinner ready till it’s almost time. I know most of you think that I spend my entire day in the kitchen and the rest of my time eating. How I wish! Recently, my real life is actually far from truth. I’ve been waking up in a tizzy because my alarm gives up after snoozing too many times. I run around making coffee and breakfast, worrying about how I’ve lost the entire morning and how I will never get through my to do list. Start working on emails, office work and finish photographing the current recipe. Grab leftovers to eat somewhere in between and then continue working till I usually realize too late that it’s time for dinner and I haven’t thought of anything. It’s true that I do cook a lot. Because I love to. And because you want me to, so that I can fill up this blog with pictures of gorgeous food and recipes. But there are lazy days, like the one on Tuesday when Denver was in Pune and I realized too late that I haven’t figured dinner. I had just joined yoga that day and was in no mood to break the healthy streak and order takeaway. It’s a little difficult putting together a meal in thirty minutes which is healthy, filling, nutritious, has fiber, is colourful and balanced. 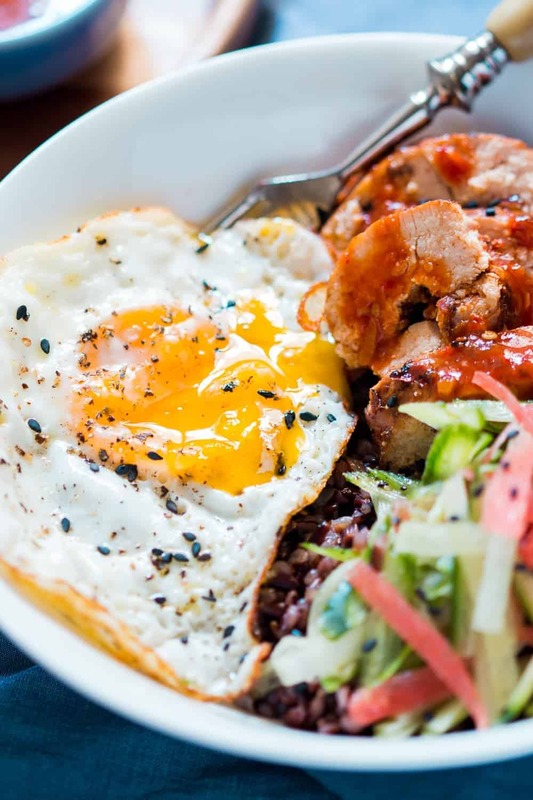 But you’d be surprised at how amazing schezwan chicken, sliced veggies, black rice and a fried egg can taste. It’s the perfect lazy girl, post 8 PM dinner dish that gives you everything you need without compromising on taste or satisfaction. It’s minimal effort with maximum taste and I can’t tell you how good, things in a bowl can taste. They all mix together and soak in all the sauces and get really nice and tasty. 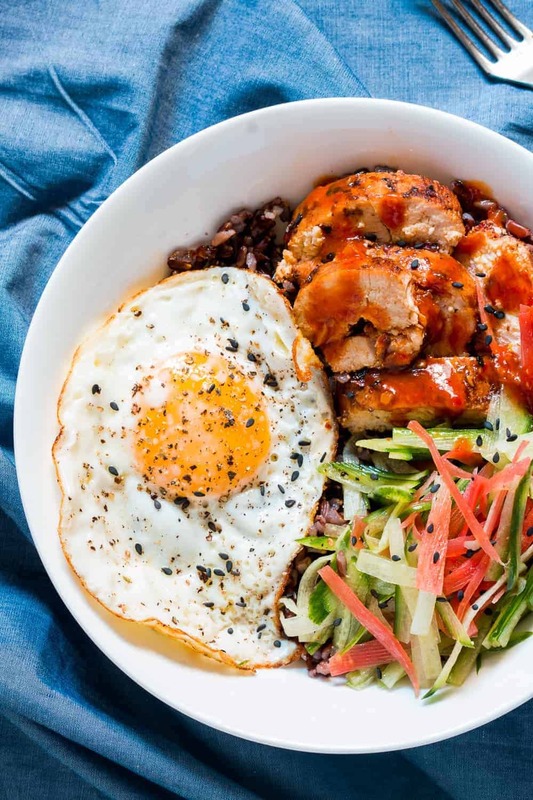 My love for a runny fried egg is evident in how often it’s used on the blog and that yolk really does wonderful things to this lazy chicken bowl. Schezwan sauce gives it a nice spicy kick and you have all the crunchy veggies to add freshness to every bite. I know my vegetarian friends are going to ask me for options – Use Cottage Cheese (Paneer) or Tofu, Potatoes, Broccoli, Mushrooms or Cauliflower instead of chicken and make this your own lazy girl’s veggie bowl! P.S. I usually have a box of cooked black rice lying around in the fridge, but if you pressure cook it, it doesn’t take long. If you try this out, tag your photos @my_foodstory on Instagram or use #myfoodstories and tell me you love this bowl as much as I do! 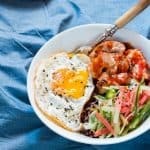 The lazy girl’s answer to dinner – schezwan chicken bowl for a hearty, nutritious, balanced meal. Minimal effort, maximum taste. Mix together all the ingredients under sauce and marinate the chicken in it. Keep aside for 5-7 minutes. In a pan, add a teaspoon of oil and slide in the chicken breast. On high flame, sear the chicken breast on both sides for 2 minutes. Reduce the flame to low, add 1/4 cup water and cover and cook the chicken for 15-18 minutes. Keep checking every few minutes to make sure it doesn’t burn. Once the chicken is cooked, remove the chicken and set aside. Add two tablespoons water to the pan to deglaze. Simmer for a minute or two till the sauce thickens up slightly. Set aside. Take another pan and add half a teaspoon oil to it. Break the egg gently into the pan and sprinkle with salt and pepper. Fry the egg till the bottom is crispy and cooked while the yolk is nice and runny. To assemble the bowl, slice the chicken and add it to the bowl, along with black rice and veggies. 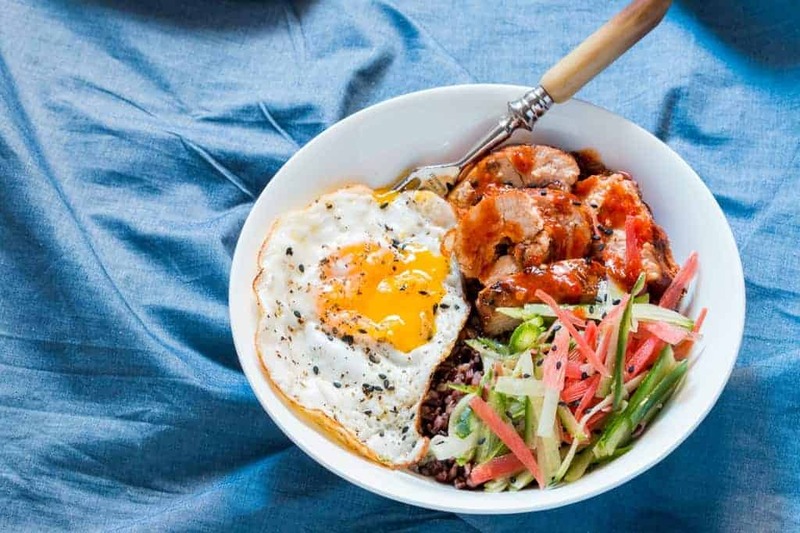 Top with the fried egg and sesame seeds if using and spoon the sauce over everything. Note 1: To cook black rice in a pressure cooker, add rice and water in a 1:2.5 ratio and cook for 3-4 whistles. Note 2: Here’s my recipe for szechuan sauce or you can use store bought sauce. Ratna black rice is a variety of rice which is unprocessed, so much healthier. But you can just as easily use brown rice or regular white rice. I have a link in the post from where you can buy black rice online if you’d like to try it. Recipe sounds great..but what is black rice?